Empathy sounds soft and fluffy, but it’s actually a hard skill that is key to corporate success. 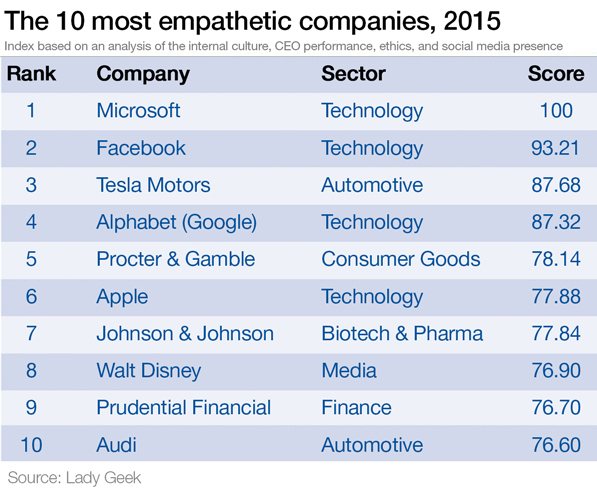 As the Lady Geek 2015 Global Empathy Index shows, businesses are more profitable and more productive when they act ethically, when they treat their staff well and when they engage openly and honestly with their customers. Not only that, but empathy can also be measured, which means its levels can be assessed, weaknesses identified and improvements made. But why should we bother? Because empathy pays. 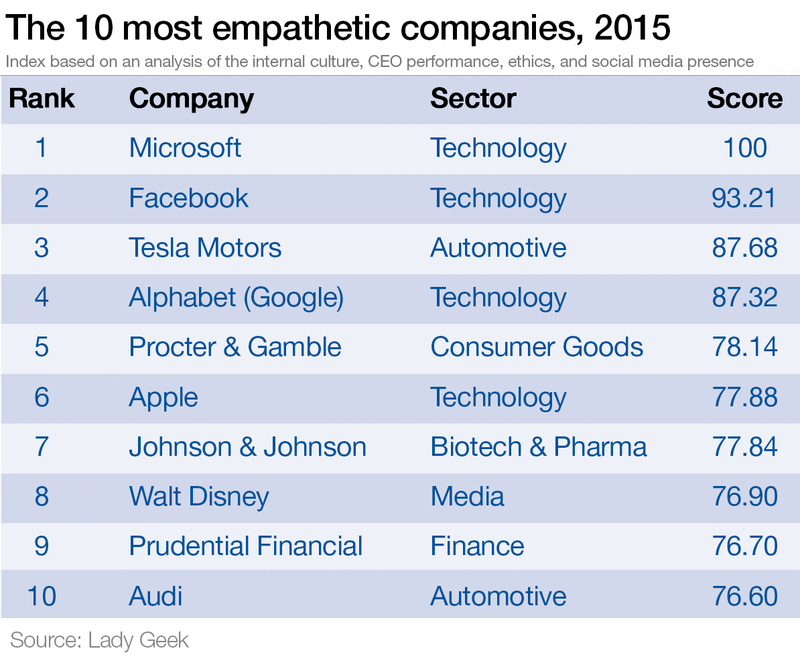 According to the Lady Geek Index, the top 10 Empathy performers generated 50% more earnings than the bottom 10, while average earnings at the top were up 6% this year whereas they dropped 9% at the bottom, and if we look at just the top 5, we see year-on-year market capitalization growth soaring at 23.3%, compared to an average 5.2% across the Index as a whole. Silicon Valley is the global empathy hub, with half of the top 10 located in California.These high-performers are fresh, open and innovative brands that are looking to beat new paths (it is significant that six times as many patents are registered in California each year as in the whole of the UK), and their results on our index contrast starkly with the dismal display offered up by the traditional blue-ribbon, old-school British FTSE elite, occupying 16 of the bottom 25 places in the Index. Some traditional business leaders have still to wake up to the potential benefits of a corporate model with empathy at its core. Because when we talk about “corporate empathy”, what we mean is a cognitive and emotional understanding of others’ experiences, resulting in the appropriate action. This includes a receptiveness to the requirements of employees, customers and clients, as well as an authentic desire to actively engage with any situation calling for resolution. And “receptive”, “engagement” and “authenticity” are precisely the sort of terms that have the traditional corporate old school quickly reaching for the dismissive “frilly and unnecessary add-on” card. And yet the truth is that these qualities are becoming increasingly essential to profitable business, as social media feeds popular demand for transparency and authentic interaction. Take VW’s recent debacle (stalling badly at 95th in our Index) compared with Audi (smoothly moving through the gears to 10th), with its well-trusted CEO and strong leadership. But just how do you measure empathy? To build up our Global Empathy Index we used a combination of publicly available information and proprietary data drawn from surveys and from social and financial feeds — including textual analysis of over half a million social media interactions. The analysis, which focuses on global companies, looks at a wide range of corporate characteristics, from CEO approval ratings among staff to the ratio of women to men on boards of directors, handling of complaints, companies’ performance on social networks; and the impact of controversy such as ethical lapses or scandals. Evaluating how you fare with regard to this set of metrics allows you to assess just what sort of empathy deficit your business is suffering, and the areas where most improvements need to be made. Just like any end-of-year report, a company’s empathy index is a vital indicator of business performance, and failure to generate a high-empathy rating can have disastrous consequences, as seen in the 32.5% market capitalization nosedive that TalkTalk underwent in the month following its less than transparent attempts to airbrush its data fiasco. In a world demanding ever-increasing levels of transparency, a company’s competitive edge comes from its ability to deliver empathy. Nothing fluffy about that. Author: Belinda Parmar (@belindaparmar) is CEO of Lady Geek, a Young Global Leader and the creator of the world’s first Global Empathy Index.